New York Jets rookie quarterback Sam Darnold has a significant right foot sprain and will miss Sunday's game against the Buffalo Bills, according to a New York Daily News report on Wednesday. 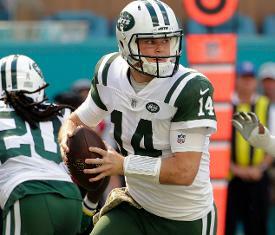 The report adds that the team hopes Darnold will return in Week 12 against the New England Patriots, after the Jets' bye, but is not overly optimistic. "Some bumps and some bruises, but everything is good," Darnold said. Head coach Todd Bowles told reporters on a Monday conference call he wasn't aware of any injury to the rookie. Darnold, who has started every game this season, finished Sunday's game in Miami 21 of 39 for 229 yards, no touchdowns and the four picks. His rating (31.8) was a career low, and his total of 14 interceptions this season leads the NFL by four. Overall, Darnold has passed for 1,934 yards and 11 touchdowns but has completed just 55 percent of his throws. If Darnold is out, 39-year-old Josh McCown would make his first start of the season. McCown threw for 2,926 yards, 18 touchdowns and nine interceptions in 13 starts in 2017 before breaking his hand late in the season.